Example of an internet chess program, Lichess, showing artificial intelligence programming– if the white bishop at b3 moves to a2, capturing the black knight, then the black pawn at b1 is programmed to capture the bishop back. Black has just moved a pawn to c2. Computer programming is the process of designing and building an executable computer program for accomplishing a specific computing task. Programming involves tasks such as: analysis, generating algorithms, profiling algorithms' accuracy and resource consumption, and the implementation of algorithms in a chosen programming language (commonly referred to as coding). The source code of a program is written in one or more languages that are intelligible to programmers, rather than machine code, which is directly executed by the central processing unit. The purpose of programming is to find a sequence of instructions that will automate the performance of a task (which can be as complex as an operating system) on a computer, often for solving a given problem. The process of programming thus often requires expertise in several different subjects, including knowledge of the application domain, specialized algorithms, and formal logic. Tasks accompanying and related to programming include: testing, debugging, source code maintenance, implementation of build systems, and management of derived artifacts, such as the machine code of computer programs. These might be considered part of the programming process, but often the term software development is used for this larger process with the term programming, implementation, or coding reserved for the actual writing of code. Software engineering combines engineering techniques with software development practices. Reverse engineering is the opposite process. A hacker is any skilled computer expert that uses their technical knowledge to overcome a problem, but it can also mean a security hacker in common language. Ada Lovelace, whose notes added to the end of Luigi Menabrea's paper included the first algorithm designed for processing by an Analytical Engine. She is often recognized as history's first computer programmer. Programmable devices have existed at least as far back as 1206 AD, when the automata of Al-Jazari were programmable, via pegs and cams, to play various rhythms and drum patterns; and the 1801 Jacquard loom could produce entirely different weaves by changing the "program" - a series of pasteboard cards with holes punched in them. 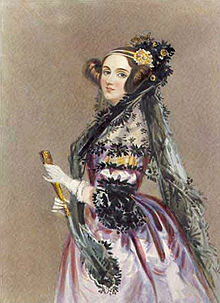 However, the first computer program is generally dated to 1843, when mathematician Ada Lovelace published an algorithm to calculate a sequence of Bernoulli numbers, intended to be carried out by Charles Babbage's Analytical Engine. Women would continue to dominate the field of computer programming until the mid 1960s. In the 1880s Herman Hollerith invented the concept of storing data in machine-readable form. Later a control panel (plugboard) added to his 1906 Type I Tabulator allowed it to be programmed for different jobs, and by the late 1940s, unit record equipment such as the IBM 602 and IBM 604, were programmed by control panels in a similar way; as were the first electronic computers. However, with the concept of the stored-program computers introduced in 1949, both programs and data were stored and manipulated in the same way in computer memory. Machine code was the language of early programs, written in the instruction set of the particular machine, often in binary notation. Assembly languages were soon developed that let the programmer specify instruction in a text format, (e.g., ADD X, TOTAL), with abbreviations for each operation code and meaningful names for specifying addresses. However, because an assembly language is little more than a different notation for a machine language, any two machines with different instruction sets also have different assembly languages. Kathleen Booth created one of the first Assembly languages in 1950 for various computers at Birkbeck College. Wired control panel for an IBM 402 Accounting Machine. High-level languages allow the programmer to write programs in terms that are syntactically richer, and more capable of abstracting the code, making it targetable to varying machine instruction sets via compilation declarations and heuristics. The first compiler for a programming language was developed by Grace Hopper. When Hopper went to work on UNIVAC in 1949, she brought the idea of using compilers with her. Compilers harness the power of computers to make programming easier by allowing programmers to specify calculations by entering a formula using infix notation (e.g., Y = X*2 + 5*X + 9) for example. FORTRAN, the first widely used high-level language to have a functional implementation which permitted the abstraction of reusable blocks of code, came out in 1957. In 1951 Frances E. Holberton developed the first sort-merge generator which ran on the UNIVAC I. Another woman working at UNIVAC, Adele Mildred Koss, developed a program that was a precursor to report generators. In USSR, Kateryna Yushchenko developed the Address programming language for the MESM in 1955. The idea for the creation of COBOL started in 1959 when Mary K. Hawes, who worked for Burroughs Corporation, set up a meeting to discuss creating a common business language. She invited six people, including Grace Hopper. Hopper was involved in developing COBOL as a business language and creating "self-documenting" programming. Hopper's contribution to COBOL was based on her programming language, called FLOW-MATIC. In 1961, Jean E. Sammet developed FORMAC and also published Programming Languages: History and Fundamentals which went on to be a standard work on programming languages. Programs were mostly still entered using punched cards or paper tape. See computer programming in the punch card era. By the late 1960s, data storage devices and computer terminals became inexpensive enough that programs could be created by typing directly into the computers. Frances Holberton created a code to allow keyboard inputs while she worked at UNIVAC. Text editors were developed that allowed changes and corrections to be made much more easily than with punched cards. Sister Mary Kenneth Keller worked on developing the programming language, BASIC when she was a graduate student at Dartmouth in the 1960s. One of the first object-oriented programming languages, Smalltalk, was developed by seven programmers, including Adele Goldberg, in the 1970s. In 1985, Radia Perlman developed the Spanning Tree Protocol in order to route packets of network information efficiently. Efficiency/performance: Measure of system resources a program consumes (processor time, memory space, slow devices such as disks, network bandwidth and to some extent even user interaction): the less, the better. This also includes careful management of resources, for example cleaning up temporary files and eliminating memory leaks. The presentation aspects of this (such as indents, line breaks, color highlighting, and so on) are often handled by the source code editor, but the content aspects reflect the programmer's talent and skills. Various visual programming languages have also been developed with the intent to resolve readability concerns by adopting non-traditional approaches to code structure and display. Integrated development environments (IDEs) aim to integrate all such help. Techniques like Code refactoring can enhance readability. "Programming a Computer for Playing Chess" was a 1950 paper that evaluated a "minimax" algorithm that is part of the history of algorithmic complexity; a course on IBM's Deep Blue (chess computer) is part of the computer science curriculum at Stanford University. Debugging is a very important task in the software development process since having defects in a program can have significant consequences for its users. Some languages are more prone to some kinds of faults because their specification does not require compilers to perform as much checking as other languages. Use of a static code analysis tool can help detect some possible problems. Normally the first step in debugging is to attempt to reproduce the problem. This can be a non-trivial task, for example as with parallel processes or some unusual software bugs. Also, specific user environment and usage history can make it difficult to reproduce the problem. After the bug is reproduced, the input of the program may need to be simplified to make it easier to debug. For example, a bug in a compiler can make it crash when parsing some large source file. However, after simplification of the test case, only few lines from the original source file can be sufficient to reproduce the same crash. Such simplification can be done manually, using a divide-and-conquer approach. The programmer will try to remove some parts of original test case and check if the problem still exists. When debugging the problem in a GUI, the programmer can try to skip some user interaction from the original problem description and check if remaining actions are sufficient for bugs to appear. Debugging is often done with IDEs like Eclipse, Visual Studio, Xcode, Kdevelop, NetBeans and Code::Blocks. Standalone debuggers like GDB are also used, and these often provide less of a visual environment, usually using a command line. Some text editors such as Emacs allow GDB to be invoked through them, to provide a visual environment. Many computer languages provide a mechanism to call functions provided by shared libraries. Provided the functions in a library follow the appropriate run-time conventions (e.g., method of passing arguments), then these functions may be written in any other language. ^ Shaun Bebbington (2014). "What is coding". Retrieved 2014-03-03. ^ Shaun Bebbington (2014). "What is programming". Retrieved 2014-03-03. ^ Fowler, Charles B. (October 1967). "The Museum of Music: A History of Mechanical Instruments". Music Educators Journal. 54 (2): 45–49. doi:10.2307/3391092. JSTOR 3391092. ^ Fuegi, J.; Francis, J. (2003). "Lovelace & Babbage and the Creation of the 1843 'notes'". IEEE Annals of the History of Computing. 25 (4): 16. doi:10.1109/MAHC.2003.1253887. ^ Mihm, Stephen (2017-08-23). "Women were the first computer programmers, then men crowded them out". The Sydney Morning Herald. Retrieved 2018-12-07. ^ "Columbia University Computing History - Herman Hollerith". Columbia.edu. Retrieved 2010-04-25. ^ Connolly, Cornelia; Hall, Tony; Lenaghan, Jim (2018-01-10). "The women who led the way in computer programming". RTE.ie. Retrieved 2018-11-26. ^ Smith 2013, p. 6. ^ Ceruzzi 1998, p. 84-85. ^ a b Gürer 1995, p. 176. ^ "Fortran creator John Backus dies". msnbc.com. Retrieved 19 November 2014. ^ "Fortran creator John Backus dies - Tech and gadgets- msnbc.com". MSNBC. 2007-03-20. Retrieved 2010-04-25. ^ a b Gürer 1995, p. 177. ^ Johnson, Phil. "In Pictures: 9 programming languages and the women who created them". ARN. Retrieved 2018-12-06. ^ a b c Gürer 1995, p. 179. ^ Smith 2013, p. 7. ^ Ceruzzi 1998, p. 92. ^ "Computer Authority to Speak Here". The Times. April 9, 1972. Retrieved October 13, 2018 – via Newspapers.com. ^ "Frances Holberton, Pioneer in Computer Languages, Dies". The Courier-Journal. December 12, 2001. Retrieved October 13, 2018 – via Newspapers.com. ^ Gürer 1995, p. 180-181. ^ "Adele Goldberg". University of Maryland, College Park. Retrieved October 14, 2018. ^ Evans 2018, p. 126. ^ Rosen, Rebecca J. (March 3, 2014). "Radia Perlman: Don't Call Me the Mother of the Internet". The Atlantic. Retrieved October 15, 2018. ^ "Programming 101: Tips to become a good programmer - Wisdom Geek". Wisdom Geek. 2016-05-19. Retrieved 2016-05-23. ^ Elshoff, James L.; Marcotty, Michael (1982). "Improving computer program readability to aid modification". Communications of the ACM. 25 (8): 512–521. doi:10.1145/358589.358596. ^ Multiple (wiki). "Readability". Docforge. Retrieved 2010-01-30. ^ Mitchell, Robert (2012-05-21). "The Cobol Brain Drain". Computer World. Retrieved 9 May 2015. Evans, Claire L. (2018). Broad Band: The Untold Story of the Women Who Made the Internet. New York: Portfolio/Penguin. ISBN 9780735211759. Gürer, Denise (1995). "Pioneering Women in Computer Science" (PDF). Communications of the ACM. 38 (1): 45–54. doi:10.1145/204865.204875.